Where and how to get the ringback tones for my company? It is common for many big and small businesses to use Royalty-Free music and ringtones in their company’s telephone, switches or call centers. What’s the main difference between copyrighted music and royalty-free music? The price of being able to use it. While, for example, in order to use a song by Madonna or Coldplay in a waiting tone any company has to get permission from the author or label and pay a certain amount of money -usually high- to the main P.R.O. (Performing Rights Organization), which is an agency that ensures songwriters and publishers are paid for the use of their music by collecting royalties on behalf of the rights owner. 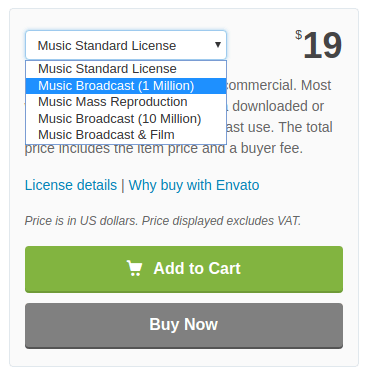 Instead, to be able to use a Royalty-Free song you simply have to pay the very affordable price of a single license. To purchase a Royalty-Free on hold tone and install it ourselves. To contact a studio that makes your tailored on hold tone. AudioJungle: Easiest option. In this marketplace, you can browse and find the songs you need from over half a million pieces of music, some of a quality that has nothing to envy to the great artists. ‘Standard’ licenses start from $29, but if your company is multinational and operates worldwide we recommend to check all the available licenses. Once purchased the license, you can download the song and use it as on hold music without any problem. Envato Elements: The cost for a monthly subscription is only $16.50 and it allows you to download unlimited songs, so it really is an amazing option if you need music on a more regular basis. Once purchased the license and downloaded the song -or songs- you can install them yourself in the business phone or ask your telephone company to help you in the process. But hat type of license do I need? The type of license you need to use for a switchboard is the so-called Music Broadcast (1 Million) in Audiojungle, at a cost of $49. If we have some budget, this is by far the best option. Not only they will create for us just a melody to wait, but also nice on hold messages, out of hours messaging, call menu options and voicemail. They also take care of every part of the process for you, from creation to installation. Onholdstudio (UK) They provide almost any service that we could need in this matter: welcome messages, voicemail, out of hours messages, voiceovers, call menu options… and they do it very professionally. Worth the price. Easyonhold (USA) They also provide a magnificent service, with many many options available with different pricing plans. You can ask for a free DEMO for your company and it will be ready in 3 days. Transmedia (USA & Canada) Consultation, scriptwriting, production and delivery are included. You can hear some actual samples on their website. When adding a custom message to the background music, be aware to align them properly to target your customers, as explained in depth in this other article. In that scenario, it is also possible to get free music without copyrights on websites like Free Music Archive or Incompetech. Usually, these songs have a specific creative commons license which serves only for non-commercial use. If they are available for commercial use, you will have to attribute its author, and that means to put his/her name somewhere and it will not be very professional from your side. A viable alternative could then be to make your own original songs with any software or make your own cover of a song that has more than 90 years old, as by law they are no longer under copyright. We, however, recommend purchasing a license, because the time you will save is worth more than the small price you pay and the quality is going to be always higher. If you need more information about it, we recommend you to read our articles about music streaming for business and background music for waiting rooms.